When people hear calls for 25 per cent less industrial cattle ranching, or even calls for “Meat-Free Mondays”, their usual misgivings centre around protein. Protein needs vary somewhat with age, between men and women, infants, children, and during pregnancy and lactation, but a safe rule of thumb is 50 g/day. World Health Organization (WHO) calculates that adults need six per cent of their calories from protein, while the American Journal of Clinical Nutrition argues that four per cent is sufficient. The US government recommends 0.8 g of protein per kg body weight per day, or 40-70 g per average weight person. Weaning people away from meat has also acquired urgency in light of the climate change problem. A 25 per cent reduction in industrial livestock and feed production, especially in formerly forested lands, would be the fastest and most feasible course to prevent climate change. The World Bank’s livestock strategy emphasises rearing livestock is the least efficient way to help the poor. The Bank’s Nutrition Strategy framed in 2007 does not mention meat. The British National Health System is removing meat from hospital menus. In contrast it is difficult to find any study proving meat intake essential. Food and Agriculture Organization’s “Livestock’s Long Shadow” bases its tolerance of or even advocacy for doubling world meat consumption by 2050 on a single paper. The best protein has several attributes. First, it must be comparable in total cost (this should account for all hitherto externalised costs, especially greenhouse gas emissions, soil erosion, desertification, water pollution, deforestation and overgrazing). Second, the best protein should come with little or no harmful substances such as trans fats, hormones, antibiotics, nitrites, nitrosamines and sodium preservatives (such as those present in cured and smoked meats, ham, bacon, sausages, pastrami). Third, the protein should be associated with healthy substances, especially fibre. Fourth, the daily mix of proteins consumed should contain all essential amino acids. Fifth, the protein should be efficiently produced; more protein produced on smaller areas. Vegetables have the highest nutrient density per calorie; only plants can make essential amino acids. Only proteins from plants satisfy these six yardsticks. A hectare planted with grains produces five times as much protein as a hectare of cattle pasture. A varied plant diet supplies all amino acids. Animal muscle is high in protein but then it also comes with saturated fats, cholesterol, even hormones and antibiotics. Such protein has virtually no fibre. Whole grain breads or pumpernickel, oatmeal, whole grain pasta, and brown rice are excellent sources of calories, minerals, vitamins and fibre, while contributing substantial protein per serving. The traditional grain-based diet is the most efficient, lowest cost, healthiest and environmentally preferred. Soymilk contains about the same amount of protein as cow milk (8 g/cup), but without the saturated fats. Human milk is perfect for human babies and adjusts its composition according to the baby’s needs. But after weaning, cow milk is not ideal for children, and even less so for adults. It is expensive to make such milk healthy. If one removes fat, and the lactose for the lactose- intolerant, the resulting product probably still contains growth hormones and antibiotic residues. Similar is the case of ruminant cheese. It is very difficult to find any cheese low in saturated fats, cholesterol and salt. Whole (unprocessed) plant foods are nutritionally the best. Most beans and peas contain 7-10 g protein per half cup cooked. Peas, chickpeas, lentils, edamame, tofu, tempeh, soy flour, soybeans contain about twice the amount of protein as other pulses. Some soy products contain more protein than beef and more calcium than cow milk. 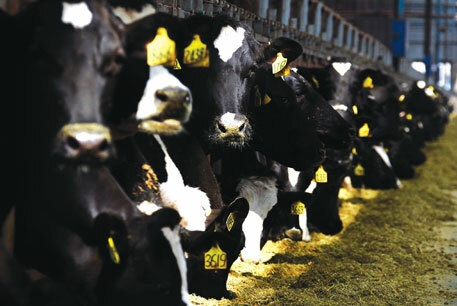 One hectare of soy produces 10-15 times more protein than one hectare of cattle pasture. One should also note that highly processed mock meats, soy duck, faux chicken, protein powders, energy bars and other manufactured foods made from isolated soy protein are no better than any other salty, highly processed food. Most nuts, seeds and pulses are rich in fibre; most are very low in unhealthy fats. Leafy greens such as spinach and broccoli, and seaweeds (such as dulse, laver bread, kim, nori) are top protein sources with no harmful associated substances, but with many other nutrients such as zinc, calcium and magnesium. Lactating mothers in Korea and Japan drink kelp soup for its high calcium content—far higher than cow’s milk. Many nuts and seeds contain 6-9 g protein per quarter cup. Some people worry that totally plant-based diets are low in substances essential to good health. The UN, WHO and the World Bank suggest fortification of staples and use of diet supplements is the most cost-effective, mainly for lactating mothers, infants and young children. Even the poor are advised to pop a low-cost multivitamin/micronutrient supplement daily. Micronutrient supplementation and vitamin B12 fortification should be a priority for economic development and poverty reduction. But plants do contain essential micro-nutrients. For example, marine vegetables (such as kelp), corn, soy, lima beans, mushrooms and strawberries are good sources of iodine. Our daily need of this mineral is about 150 µg. Iron is often low in many diets, but is easily and cheaply available in green leafy vegetables and pulses. Most plant iron does come in a less easy-to-absorb form. But this is readily overcome with extra vitamin C, which vegans get in abundance anyway. The first case of zinc deficiency was reported in 1961. As soils in developing countries are being depleted and becoming more acidic, zinc deficiency could intensify, impairing neural function. Now 400,000 people die of zinc deficiency every year. WHO and the World Bank believe fortification of cereals and tortilla flour is the most cost-effective way of coming to terms with this predicament. Wheat germ, yeast, whole grains, pulses and algae are good natural sources of zinc. Up to half a million young children in developing countries are blinded annually from vitamin A deficiency. Carrots, yams, broccoli and other leafy greens can help alleviate the problem. The human requirement for vitamin B12 is tiny, about 1.5 µg/day, yet essential. Neither plants nor animals make vitamin B12. Only micro-organisms (bacteria) produce vitamin B12. Common button mushrooms (Agaricus bisporus) are good sources. Adding a teaspoonful of B12-fortified yeast to your daily soup or stew fully meets requirements. Most soymilk and cereals are fortified with B12. Root crops (unpeeled potatoes, yams, sweet potatoes) grown in naturally fertile soil used to be sources of B12. But now with industrial agriculture depleting the soil into an almost sterile growing medium with chemicals and biocides, that source of B12 has fallen. Emphasising plant protein will reduce the risks of hunger and of climate change in the decades to come. At the same time plant protein costs less and is healthier than meat protein. "One hectare of soy produces 10-15 times more protein than one hectare of cattle pasture." That statement is perhaps true - but it needs to be recognised that soy is pushing out livestock everywhere where it can be successfully grown. Simply because it is more profitable to grow soy (another story is that most soy is used as animal feed!). Most pastures are simply not good enough for being plowed, which is why cattle is grazing in Monana while corn and soy is grown in Illinois - and wheat in between. Instead of just putting an American article directly down for us peasants, we would have appreciated a real study on Indians for Indians. How many people eat beef here everyday? The vegetarian diet in India has lots of B complex vitamins produced during fermentation, which is a big part of the process for making dosas, idlis, dhoklas and other such delicacies. What a brilliant article by Goodland, it summarises the latest science of nutrition very well and in line with Prof Colin Campbell's groundbreaking research at Cornell. Though perhaps US oriented the science is relevant to India for its agriculture and nutrition policies in the future. Good work DTE!